It’s a fantastic sight to see a slalom water skier cutting up a glassy calm lake, usually in the rising sun or the quiet of the evening, kicking up a wall of water with each turn and quickly zipping back across the wake. In the Whiteshell, this might be a less common sight in comparison to other water sports such as wakeboarding, wakesurfing, tubing etc. 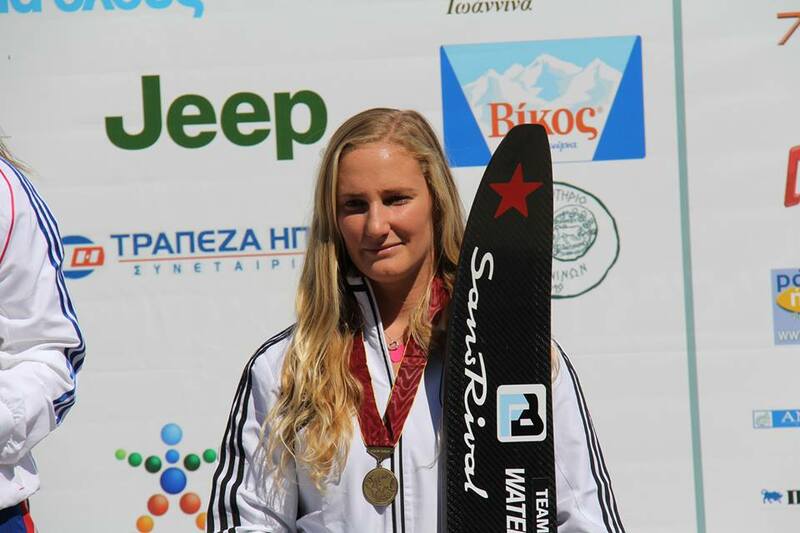 So it may come as a surprise to some to know that a professional water skier started her career in the Whiteshell and is now one of the top 10 female slalom skiers in the world. Experience the Whiteshell talks to Geena about starting out in the Whiteshell, travelling the world, and why she will always keep coming back to her roots. 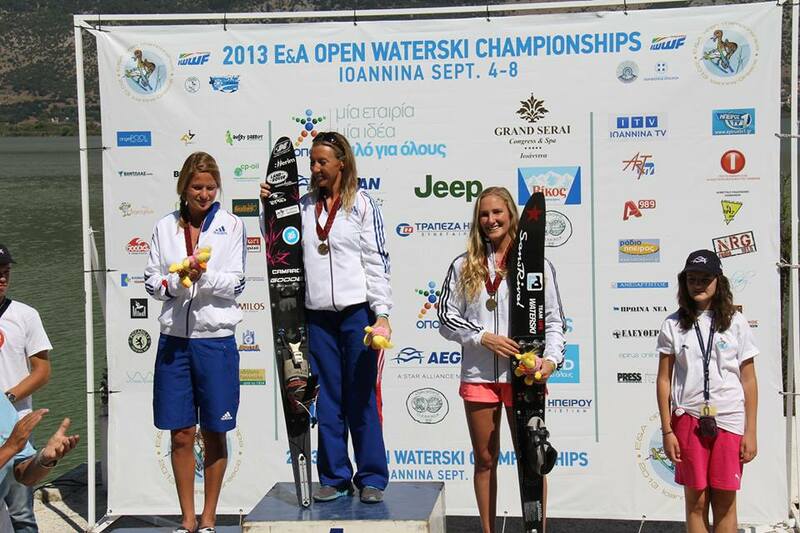 The name Geena Krueger is well-known in the water skiing world. 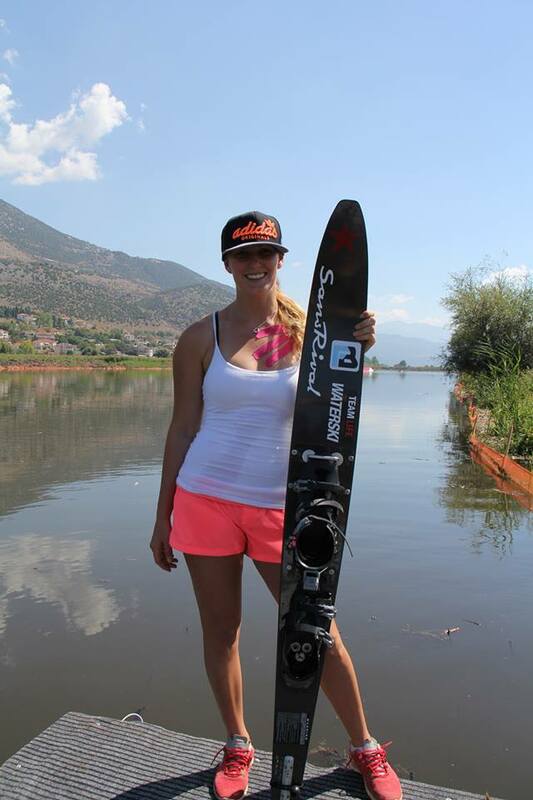 She has travelled all over the world for tournaments, has several titles in the sport, is one of the top ten female slalom water skiers in the world, and is currently ranked third in Europe. It all started at her family cabin on Star Lake, in the Whiteshell Provincial Park. Geena’s first experience skiing was at the family cottage on an island at Star Lake. She learned to ski at a very young age when her dad propped her up on his own skis. “My very first memory I remember going on his skis and then I started going off the Star Lake beach on my own,” said Geena, who was only five years old when she got up on two skis. 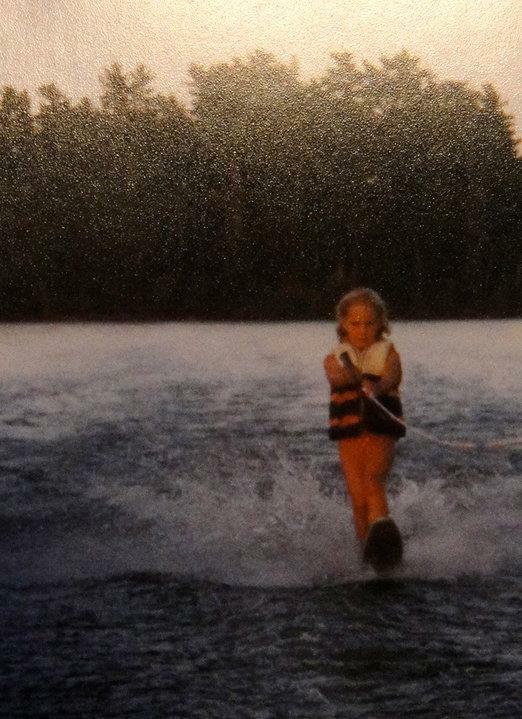 Then the next summer, at age six, she kicked off one ski and started slaloming around Star Lake. Geena slalom skiing on Star Lake at age six. In 1998, Geena’s family bought a cabin on Lake of the Woods (the Star Lake cabin belonged to Geena’s grandparents). On Lake of the Woods they were close neighbours to the people who owned Sportsman Marine & Ski in Winnipeg, who were the first to introduce the Kruegers to a slalom ski course and even gave them their slalom course because they didn’t use it anymore. The Kruegers set up the course in a quiet bay on Lake of the Woods, close to their cabin. Geena says she was about 12 or 13 years old when she started going through the slalom ski course, and she did her first tournament at Betula Lake in the Whiteshell. First tournament, breaks a record….. No big deal. But it was the start of what would soon become a professional career for Geena. From there she started doing a few more tournaments and then went to Rollins College in Winterpark, Florida. That’s where Geena became really serious about skiing. Geena chose to go to Rollins College because she knew that’s where she could continue to progress her water skiing career. Along with slalom Geena also does trick and jump skiing. Slalom, which is her strength and her personal favourite, involves skiing through a course that consists of six buoys, with an entry gate and an exit gate. For slalom, the maximum speed for women is 34 miles/hr or 55 km/hr. Once you complete the course at maximum speed, you keep shortening the rope length, making it more challenging to turn sharp and cut across the wake in time to get around next buoy. Trick skiing is based off a point system that involves two 20 seconds passes to do as many tricks as you can. Jump skiing is based off the distance of the jump. Water skiing has given Geena the opportunity to do what everyone dreams of: Travelling the world to do what you love most. In March she skied at a pro tournament in Melbourne, Australia, and at another one in Milwaukee, Wisconsin in June. She recently received a bronze medal and the Europe and Africa Championships in Greece, and is heading to her first Open World tournament in Chile at the end of November. 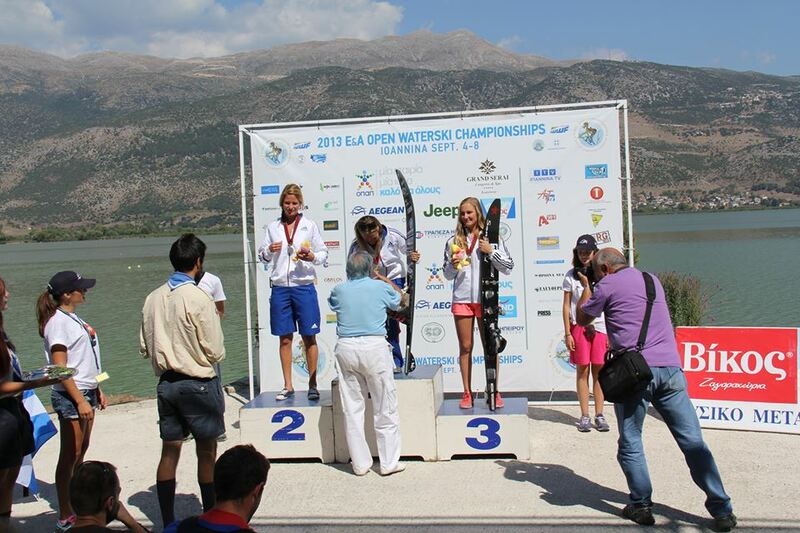 Geena (far right) on the podium at the Europe and Africa Championships in Greece. 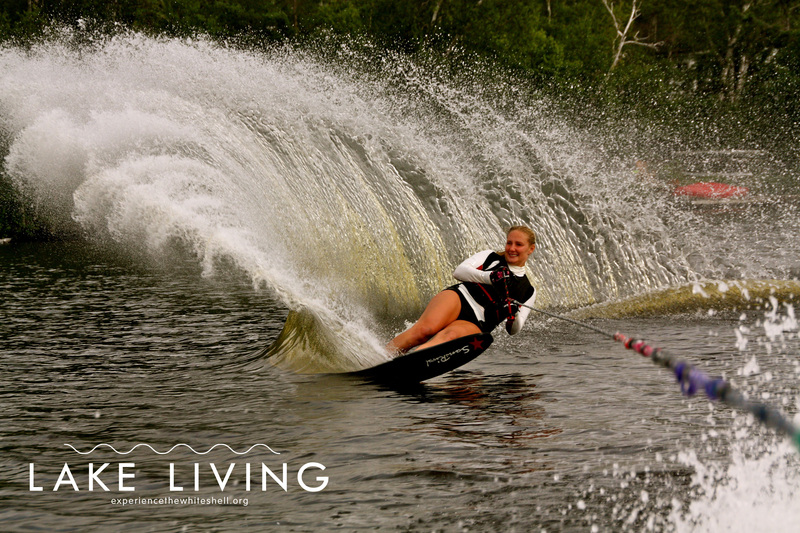 Geena skiing on Star Lake – Summer 2013. All this world travelling doesn’t stop Geena from coming back to visit and ski at the place where it all started: in the Whiteshell Provincial Park. She says she will continue to return to the Whiteshell and Lake of the Woods every summer. This entry was tagged Betula Lake, Florida, Lake of the Woods, manitoba, Milwaukee, Pro, Rollins College, Slalom, Star Lake, waterski, whiteshell, whiteshell provincial park. Bookmark the permalink.